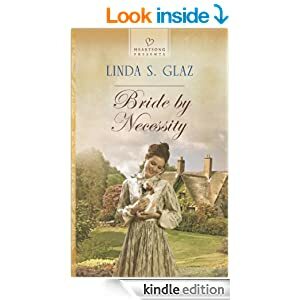 I volunteered to read Bride by Necessity directly from the author, a woman I have personally met at our Faithwriter Conference - Linda Glaz. With summer here and I'm free from work responsibilities, I jumped at the chance for a free book, as you can imagine! Linda is, "married with three children and three grandchildren. Her triple-A personality allows her to be an agent with Hartline as well. She loves anything with the written word, and loves stories based on family lore. Rich stories wait to be fictionalized and written, stories handed down through families, no matter legend or exact truth. Linda loves the opportunity to write or find "just the right book" to shake up the industry. She's a charging train: "All aboard!'" Bride by Necessity is her fifth Love Inspired Heartsong book with the sixth to come out in October. As she describes herself, she certainly is a charging train. That's the only way I can resolve myself to give the review that I have to give. This book takes place in England in 1855. It starts with bad news, as many do. Payton Whittard is the female main character. She is suddenly whisked from a very humble, poor beginning to living with a very rich man she always feared. I wish that's all the description there was to this book. I was able to guess almost everything that was going to happen. Either too much was given away in order to sell the book or it was too contrived to make it move along faster. That wouldn't be Linda's fault. The Heartsong books are short. I enjoyed the characters: Payton is a tom-boy; Jonathan is still trying to recover from a broken heart. I also liked several of the servants that Linda brought to life. I got lost in a couple of places but I believe it was because of the pacing. It was way too fast. First they were mad at each other and the next sentence they weren't. It was hard to keep up - like a teenage romance but neither of these were teens. And Payton was hardly an orphan, as the blurb describes her. She was twenty years old - I'm sure an orphan status in the 1800's but it's still hard to imagine for us now. I so wish Linda had the opportunity to write this book in full. There is so much more she could have done to let us explore the characters and understand the reasons behind their decisions much better. It's not an awful book but it did put me in frustration mode. I truly enjoyed Payton and Jonathan. So, even though this was a hard review to write, Linda asked for honesty. I would like to know what you think of it. Buy it! Read it. It will take you a day or two and will transport you to another time and place. That's not a bad thing, huh?! Thank you Linda, for letting me read your book. I can't wait to read more! I finished another year of school. I used sick days for my grandson Kaden more than I did for myself. No surgeries! Nothing that knocked me down for days on end! All in all, we had a pretty good year. I also completed a 5K. I'd been training for it but didn't finish before race day. I ran it in 39 minutes and came in 2nd in the women's 50 and over bracket. Mind-blowing! Yesterday I rode my bike for 38 miles. Five of those miles were with a student from school and the rest was just me. It was challenging but fun. Funny thing is, all of these took a long time to get through, but the very hardest parts was towards the end. Isn't that crazy? 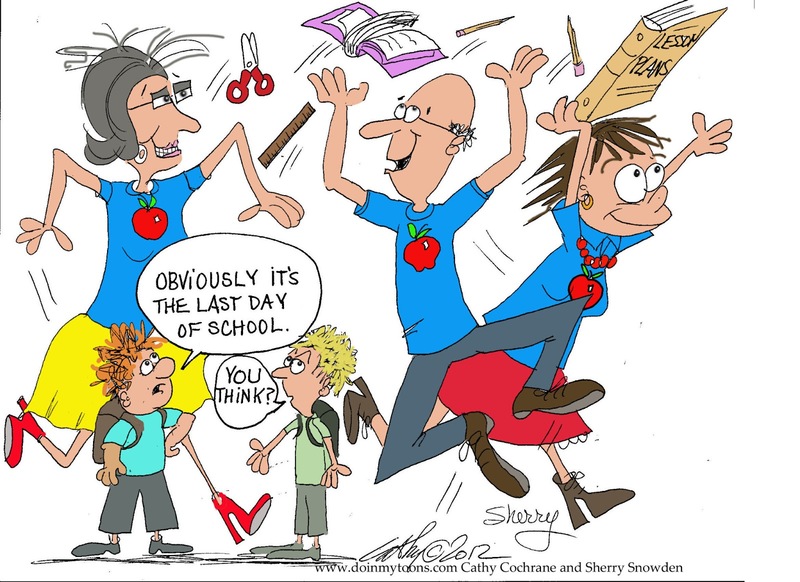 We couldn't wait to get to the end of the school year but then the end brought up all kinds of stress. Will I be able to walk tomorrow? Will I be able to step into the car to get home? The bike ride. Oh my! Honestly, I didn't mean to ride that far but I got lost. Lost is my usual state but it's especially bad when on a bike. My problem is, I don't like to go back the same way I came. That gets me into a whole kind of bad. But I did it. I did it! All 38 miles. I knew if I couldn't go on or if I couldn't get myself 'unlost', my husband was a phone call away. Funny thing is, the point I really wanted to give up was when I could see the finish line. I barely moved my legs the last 4 miles. Very sore. Very tired. Very sun burnt. It was a 4 hour ride and the last 20 minutes or so, I was ready to throw in the towel. Catch a ride with a passing farmer. The end, I had a hard time getting to the end, but...I did it. I did it! I made it to the end. I just waved at the farmers as they drove by in their pickup trucks and who could have very easily taken me the rest of the way home. I kept on running when I was encouraged that the finish line was just up ahead. I kept on plugging away at school with every one else even though we were just done. All of us. This is how I want to live my life every day. I want to push past pain barriers. Push past mental barriers. Push past my own self-doubt. Finishing a year of school may not seem like much to some people but this is the first year in a long time that I've not had an extended leave of absence for a surgery or sickness. It's a big thing. A 5K might not seem a big thing but I've been sick for so long that it is a big thing. For me. It's HUGE! Riding my bike for 38 miles, even on accident, riding places I've never ridden before - pushing past fears of getting lost - that's big. Big for me. And I just rode. I didn't care. I knew God was taking care of me and my husband would bail me out if need be. I'm jumping past so many barriers in my 50th year of life. I'm wondering how many more I can add.